“Death Curve, Vanderbilt Cup, Santa Monica 26th Feb. 1914"
Eddie Pullen in his debut at Santa Monica swiftly moved away from the fourteen other starters in the then fastest ever road race. His record, set on lap seven, gave an average speed of 81.5 mph. 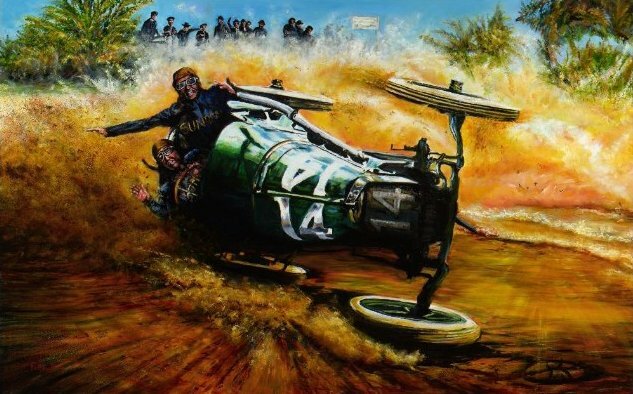 In this spectacular accident on lap thirteen, his right front tyre explodes with the wheel collapsing as a result of Pullen skidding into the bend. Both driver and mechanician were shaken up but uninjured and went on to win the Grand Prize race two days later, which features the J.B Marquis accident featured below. Ralph de Palma went on to win arguably the finest race of his career. John B. Marquis’s strategy was to fuel his car heavy to run the race non-stop. He was leading when taking Death Curve too fast. The Sunbeam rolled three times. Mechanician Harry Hough was thrown clear, but Marquis lay unconscious under the car. Fortunately, the weight of the car was not resting on Marquis. It was thought that he had been killed, but on admission to hospital, miraculously, he had not broken a bone, and thus he survived to drive another day. As noted above, Eddie Pullen went on to win the race. “Death curve” was a name dubbed by newspapers to boost sales. Despite its sinister name, no serious injuries were ever sustained in the course of racing at this corner, but it was a popular viewing point for spectators as many a driver lost control at this turn. It should be noted, however, that H.J. Horsman, an unofficial entrant made an unauthorised foray onto the course and, with his mechanician C.F. Schwartz, perished at this corner in 1916, driving his newly-acquired Mercer. “Chain your dogs and lock up your fowls” proclaimed the posters on the first Vanderbilt Cup road race of 1904. In those pioneering days of the sport, most spectators were oblivious to the potential danger. These races were held annually until 1910, with crowds of between twenty-five thousand and two hundred and fifty thousand. 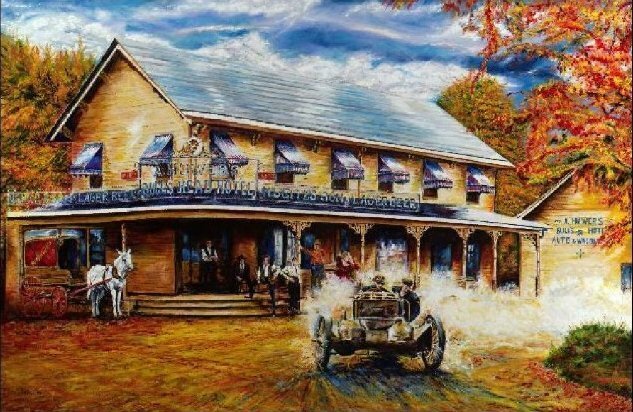 Featured is the unique fifty horsepower Christie driven by its designer, J. Walter Christie, driving in the 1905 race, and can be seen passing Aloyous Huwer’s Bull’s Head Hotel, Long Island. It met with little success. The year before, he had equalled the world record for petrol-driven cars covering a mile in 51.15 seconds. His racing career would end in a near-fatal accident in 1907. This great inventor is, however, remembered now as “the father of the modern tank”.